Invacare's Spectra XTR has been developed to combine powerful driving performance with comfort. High torque motors and a unique suspension design provide a smoother, easier ride. Modulite™ seating offers unrivalled flexibility and modularity providing a solution for many postural needs. 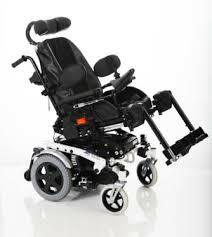 Take a closer look at the UK and Irelands best selling powerchair. Comes with Electric Tilt, Electric Recline and Electric Leg Risers.